← Am I gorging on grace? They needed help with craft supplies for a summer camp at a local elementary school. Pipe cleaners, yarn, craft foam…and buttons. Buttons I’ve got, in all shapes and sizes. I pull out the button tin and begin to go through the contents. Many are still in their tiny envelopes, often nestled next to a bit of thread meant to match the garment if a repair were needed. Should I part with all of these. What if I need one – a specific one? And then I see several that are fabric-covered and one with a metallic crest. I remember the garments these were meant to accompany. They are long, long gone. I gave them away or grew out of them or moved on from them many years ago. A whole career ago. Seems almost a lifetime ago. 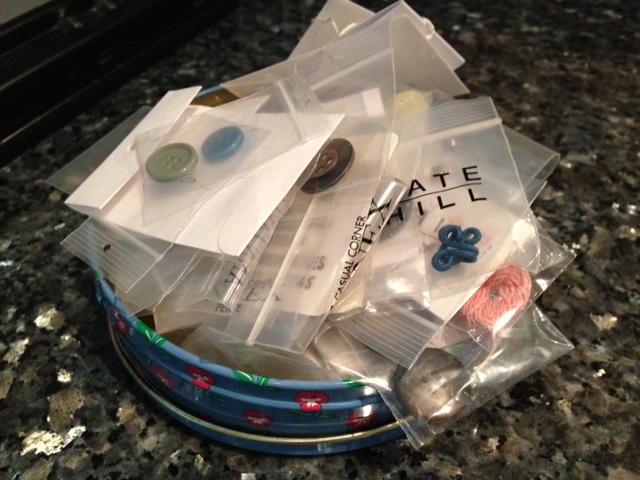 I dump my mound of buttons into a bag and ready them for delivery to the craft lady. Feeling industrious I take the now empty tin to a drawer where I have collected the buttons that came with my most recent wardrobe additions. Soon, the tin is full again to overflowing with extra buttons and threadlets, just in case a repair is needed. Amazing what one holds onto. Funny how, when we manage to let go, we realize our ample and updated supply. Imagine, I have a drawer full of notions. Accessories meant to repair or replace what might break, fall or be lost. Perfectly matching so no one need know that I needed mending. Now that is a heavenly notion. Posted on July 1, 2013, in In Action, Mind and tagged buttons, Christ, crafts, kids, mending, notions, sewing. Bookmark the permalink. Leave a comment.